Show your love and sympathy by sending a pretty angel holding a bouquet of flowers. The angel is made of cement and can be taken home to be enjoyed by a family member or can be sent to the cemetery as a loving tribute. Either way the family will be blessed to receive this gift. Angel and flowers may vary depending on availability. The stone reads,"Those We Love don't go away, They walk beside us everyday... unseen, but Always near, still Loved, still Missed and Very Dear." The shown price is the stone and an easel only. 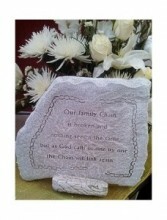 Price points 2 and 3 include a flower arrangement or plant to make this beautiful stone even more memorable. 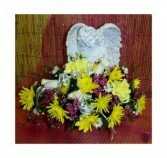 This lovely angel, bearing a mixed arrangement of bright flowers, is the perfect gesture of comfort and sympathy. Price point 1 only includes the angel. 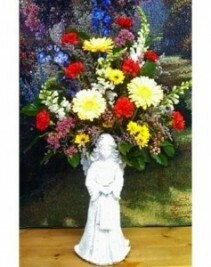 Price point 2 includes the angel and a smaller arrangement. Price point 3 (shown here) includes the angel and a large arrangement. 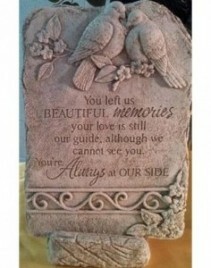 This gorgeous memorial stone bears the poem, "If tears could build a stairway, and memories a lane, I'd walk right up to Heaven and bring you home again." Price point 1 is the stone only. Price points 2 includes a flower arrangement or plant to make this stone even more meaningful. This stone bench is engraved with, "Perhaps they are not stars in the sky, but rather openings where our loved ones shine down to let us know they are happy." 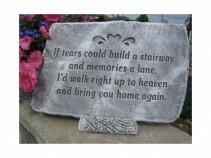 It is a elegant and meaningful addition to any garden. Price points 2 and 3 include various plant and flower arrangements. This stone comes with an arrangement. Price 1 is a smaller arrangement. Price 2 is a larger arrangement. 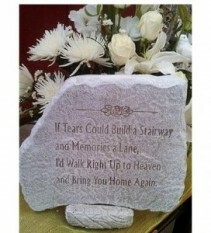 This lovely memorial stone reads, "If tears could build a stairway and memories a lane, I'd walk right up to heaven and bring you home again." 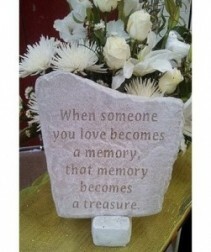 Price points 2 and 3 include a flower arrangement or plant to make this beautiful stone even more memorable. 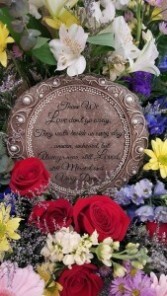 This lovely memorial stone bears the comforting poem, "Those we love don't go away, they walk beside us every day, Unseen, unheard, but always near, So loved, so missed, so very dear." 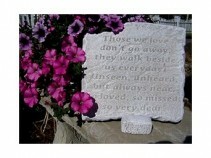 Price points 2 and 3 include a flower arrangement or a plant to make this stone even more beautiful. This lovely memorial stone reads, "Our family chain is broken and nothing seems the same but as God calls us one by one the Chain will link again." Price points 2 and 3 include a flower arrangement or plant to make this beautiful stone even more memorable. 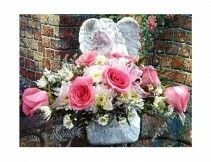 This lovely stone angel bears a bouquet of roses. 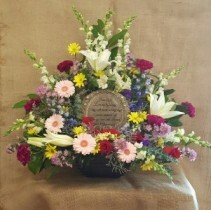 It is the perfect gesture of comfort and sympathy. Price point 1 includes only the angel. Price point 2 includes the angel and a smaller arrangement. Price point 3 (shown here) includes the angel and a larger arrangement. Roses come in pink, red, yellow, or white. 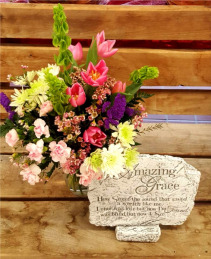 The stone reads,"Those We Love don't go away, They walk beside us everyday... unseen, but Always near, still Loved, still Missed and Very Dear" and is placed into a beautiful garden style arrangement includes roses, Gerber daises, and lilies. Price Point One is a smaller arrangement.